Shimmer #18 hit the streets like a boss in February, and here are three reviews as to its gorgeousness! We hope you loved Shimmer #18, and that you will join us for Shimmer #19 on May 1st, when we go absolutely and positively digital! A couple of reviews on Shimmer 17 from around the interwebs! Do you have your copy yet? SFRevu still considers Shimmer one of its favorite small press reads. Huzzah! Casual Debris says: Shimmer Seventeen features a little sci-fi, some nice ghosts, as well as more than one second-person narration, several unsympathetic mothers and three Canadians, all tossed to the far-end of the collection. My favourites are those by Alex Dally MacFarlane, Yarrow Paisley and Kim Neville. I was in there at issue #1 in January of 2006. My review began with “This is a nicely produced new small press publication. The editor states that she wants a ‘particular kind of short story — the combination of a strange and original idea, a well-developed plot and characters, delivered with exquisite writing.’ Does it succeed at this? Let’s see.” After reviewing individual stories, I concluded with “So yes, this is well worth the $5. Buy it!” So what about this issue? On Shimmer’s home page it states that the magazine publishes “contemporary fantasy short stories, with a few ventures into science fiction or horror, and the stories tend to be tinged with sorrow (though we’re not averse to the occasional funny tale)” and I found this to be accurate. Shimmer has a distinct feeling to it: rawer than Apex and more surreal and fantasy-oriented than the classic science fiction that you might find in Clarkesworld. There was something very physical about some of the stories in issue #16 of Shimmer: an awareness of the body, the blood, and of mortality. Though the stories taken as a whole don’t turn away from the classic narrative shape they don’t embrace it, either, tending at times towards provocative, moody meditations on life, love, and death. Mr. Long serves up some thoughts on each story–thank you Mr. Long! The folks at Casual Debris have reviewed Shimmer #15. What a nice little publication. I’ve been meaning to get a subscription to this respected quarterly, and as soon as I subscribed online I received an e-promise from publisher Beth Wodzinski that she’ll drop it in the mail shortly. A week later I had my copy. Service like that alone deserves a subscription. Shimmer has recently announced that it is paying professional rates for its stories, which is big news for this little magazine. It publishes contemporary fantasy, with an occasional foray into science fiction or horror, “and the stories tend to be tinged with sorrow,” as its home page says. On the basis of Issue 15, I’d call that a fair description — especially the sorrow part. Issue 14, Reviews, Why We Rock! SFRevu has delightful things to say about Shimmer #14! In short: “Shimmer is the kind of magazine you should read in one sitting, letting the beautiful words wash over you.” We couldn’t agree more! 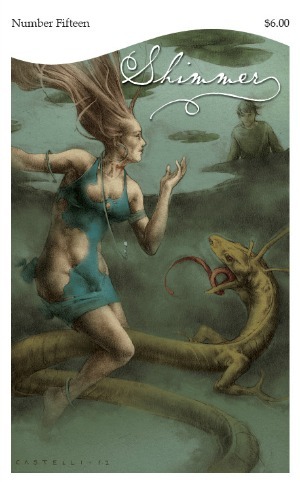 Don’t forget, Shimmer #14 is our first issue that is available for the Kindle. This week, it’s an amazing 99 cents (77p for you across the pond!). “Four Household Tales,” as told by Poor Mojo’s Giant Squid, also gets a nod! The Portal has some mighty kind things to say in their in-depth review of Shimmer #13. People are saying good things about Shimmer #13. Are you one of them? If you’ve reviewed Shimmer, let us know!